Do you Spring Clean? I normally just try to keep things pretty maintained year round but this year I’ve been getting the itch to do some big deep cleaning so that when we come back from staying with family I’ll be greeted by a sparkling clean place! Thanks to being a Bzz Agent I received a pack the other day with all this great stuff to help me! I’ve used most of it already! I *loved* the Glade candle! It smelt and burnt as nicely as all the higher end candles that I normally like to purchase–and the label comes right off so you can make everyone think you spent a bunch on it too! 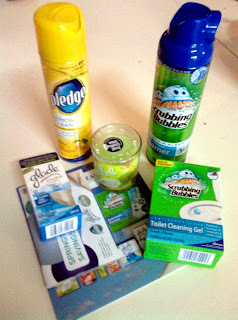 I’ve been in love with all of Scrubbing Bubbles products since my best friend recommend them to me, but had never tried their toilet cleaners before. I have been so super happy with the gel! It not only works incredibly well it makes the bathroom smell really good every single time you flush! I will definitely keep buying those in the future! I have several high value coupons for Glade and Scrubbing Bubbles Products that range from 75 cents to $3 in value. If you’d like some just let me know and I’ll mail them to you! If I have more people ask than I have coupons for I’ll random.org to see who gets them! I’ll try to send you one of your choice, but will also random.org if some seem more popular than others! My only request is that you be following me somewhere, somehow for this! 🙂 I’ll pick who gets them 4/7. I would love the coupons. I love saving money with them.